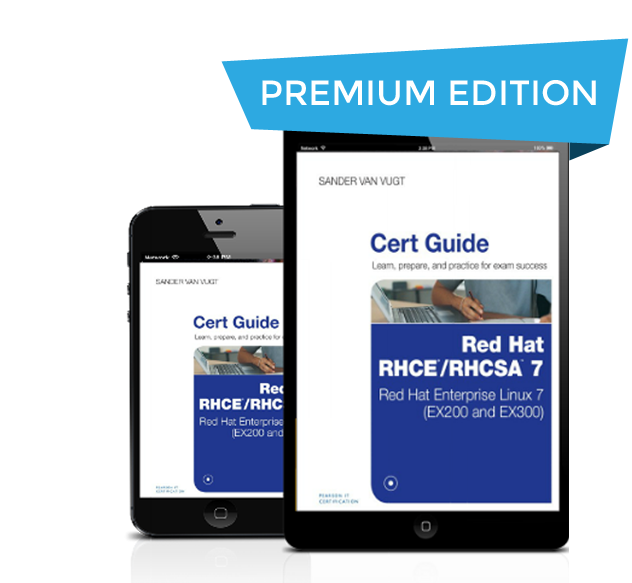 The exciting new Red Hat RHCSA/RHCE 7, Premium Edition eBook and Practice Test is a digital-only certification preparation product combining an eBook, 4 complete sample exams, PLUS 4 more bonus exams–a total of 8 practice exams in all (4 for RHCSA and 4 for RHCE)! 8 Complete practice exams: 4 for RHCSA and 4 for RHCE in PDF format. Gain expertise and knowledge using the companion website, which contains more than 40 interactive exercises, 4 advanced CLI simulations, 40 interactive quizzes and glossary quizzes (one for each chapter), 3 virtual machines and more. Red Hat RHCSA ®/ RHCE® 7 Cert Guide is your guide to get certified for Red Hat Enterprise Linux 7 (EX200 and EX300).